This past Saturday- my sister and I hosted a bridal shower for our step-sister, Aubrey. She's met a wonderful man and we couldn't be happier for her! Her colors are grey and pink and I think it's just beautiful! But they are so excited about Aunt Aubrey's wedding! 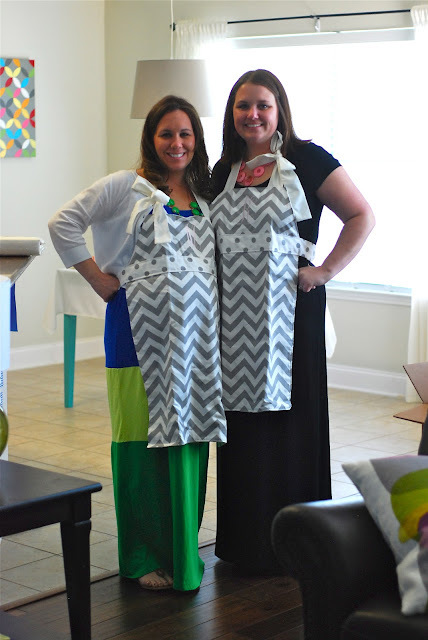 Aubrey got us these super cute monogrammed aprons as our hostess gifts. Love it!! Can't wait for Aubrey and Greg's special day! So excited for them and their new life together!